Pneumatic spray guns, when properly adjusted and operated, produce consistent and smooth paint surfaces that can't be achieved in any other way. However, since most people don't take the time to understand how the gun works the results are often very poor. This, in turn, causes many hobbyists to lose faith in the equipment or to be hesitant to use it because they don't really understand all the adjustments. Let's clarify the subject. Paint guns convert the fluid paint into thousands of tiny, atomized droplets. To do so the guns have specific components that must work in unison. Guns come generally in four forms: Pressure, Siphon, Gravity-Feed and HVLP (high volume - low pressure), in order of efficiency. Pressure and Siphon-feed guns are the oldest of designs. In pressure guns the fluid is pressurized, allowing it to flow out (these aren't used much anymore). In siphon guns the movement of the air inside creates a siphon that pulls paint out of the reservoir. Gravity-feed guns mount the paint reservoir on top and utilize gravity to allow the paint to flow down into the air stream. HVLP guns come in both siphon and gravity-feed forms and are designed to utilize low air pressure (10-20 psi) to flow a relatively large volume of paint. Their chief advantages are: low overspray and, therefore, a much higher transfer ratio of paint to the surface. The Reservoir is the cup or can that holds the paint. Siphon guns can have reservoirs that hold as much as a quart of paint, whereas gravity-feed guns typically hold about a pint. The sole purpose of the reservoir is to hold paint and to allow atmospheric pressure inside, usually through a non-spill valve or pinhole vent. The Air Cap is the part that does the real work. It has precision-drilled holes that are carefully placed to produce the best atomized pattern, or Fan, on the surface to be painted. Air entering these holes not only atomizes the paint but also creates the shape of the fan. The Fluid Tip sits inside the air cap. Its internal size is dependent upon the viscosity of the material being sprayed and various sizes are available for every gun. Inside the air cap's center hole sits the fluid needle. The Fluid Needle is a tapered shaft that is attached to the gun's trigger. When the gun is triggered slightly it opens the air valve and starts retracting the fluid needle into the gun. The unseated needle allows material to flow and to be atomized by the air cap. As fluid volume increases, more air is required to atomize the paint. 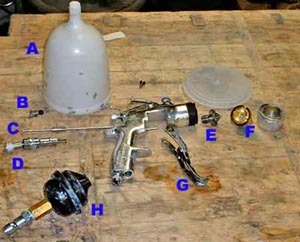 Note the two areas on the air horn, one set adjacent to the fluid and one on either side of the air cap crown. These air outlets disperse and shape the "fan" we see coming from the gun. Distortion in that fan is often a result of clogged air passages, damage to the air orifices or leaks in the system. Cleanliness of the gun is essential for proper operation. So What's So Difficult about Using a Spray Gun? Nothing, really, but most of us get impatient to start painting and don't want to spend the time to get accustomed to the gun. Consequently, we don't get the adjustments correct and the gun is blamed. The chief things to remember about spray guns are: 1) air pressure; 2) fan size; and 3) paint flow. The inlet air pressure on a particular gun is recommended by its manufacturer, and for most siphon/gravity guns is between 30 and 50 psi. Greater air pressure atomizes paint more, but also creates more overspray. It can also dry out the solvents and cause more "orange peel" in the paint surface. The fan control is used to control the spray pattern width. As a rule, most painters want to use as wide a fan as possible, but as the fan widens, the amount of material distributed decreases. Paint flow is generally adjustable on modern guns and should be optimized for the specific paint being used. Usually this adjustment - once set - doesn't need to be changed unless a different air cap/needle is used in the gun. While there are three adjustments to be made and gross misadjustments can be frustrating, the real secret of getting good results from a gun is simply to prepare the paint and then shoot test patterns on a clean scrap panel or paper-covered surface. A little "playing around" with the gun for a few minutes will ensure an excellent pattern and a good painting experience. The disassembled gun. Note that the reservoir (A) is easily removable for cleaning. Below it are the fan control screw (B) and the needle (C). Under the needle are the spring-loaded parts (D) that hold it in and adjust how far it will move when the trigger is pulled. At the front of the gun are the fluid tip (E) and the two parts that comprise the air cap (F). The trigger (G) and air filter (H) assemblies are removed for cleaning. 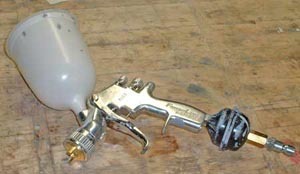 This gravity-feed gun is assembled and ready for painting. Attached to the bottom of the handle are an air filter (black) and quick-disconnect fitting for the air hose. The filter is a good final security item to trap contaminants and moisture in the air line. A quick-disconnect fitting is always a desirable thing to have because it allows greater flexibility in moving the gun from place to place or changing to other air fittings around the shop.